If you look at the world today the imprint of Homo Sapiens is everywhere. Our impact is undeniable, from massive cities built by great empires, to religions and politics that govern most of not just what we do, but the rest of the natural world, and plants and animals subjugated and domesticated to our needs. 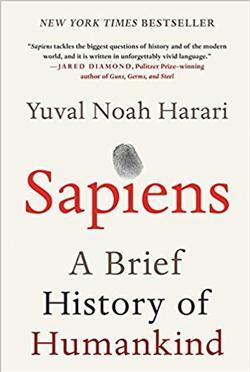 In Yuval Noah Harari's book, Sapiens: A Brief History of Humankind, he takes on the task of showing the reader how bands of hunter-gatherers in east Africa manged to spread to every corner of the globe. In a little over 400 pages, about 100,000 years of human history is covered. Where I feel the book really shines is rather than focus on who and when, bogging the reader down in endless names and dates, Harari focuses on the why, digging deeper into the causes of history and giving us the prospective that can only be found with an abundance of hindsight and a deep imagination. What we are given is a wonderfully readable and insightful book, taking both the history buff and the novice on a journey through human history like never before.